The Iowa Speedway, “America’s Place To Race” in Newton, Iowa announced that they would host the U.S. Cellular NASCAR Camping World Series East/West Challenge on May 17, 2009. NASCAR vice president of racing operations Steve O'Donnell said in a news release, "The Midwest has some of our sport's most loyal fans, and Iowa Speedway produces some incredible racing as we've seen with the NASCAR Camping World East and West Series. We look forward to racing there." So do at least some top-level racers. NASCAR star Carl Edwards told The Des Moines Register recently that Iowa Speedway is "real special." "I feel like the fans in that area, they're hard-core racing fans," said the Columbia, Mo., native, who plans to race both the Sprint Cup and Nationwide Series schedules full-time again this season. "There are more dirt tracks in Iowa than probably any other state in the country. I feel like when we go up there to race, the fans are really going to support this, so that's exciting." In addition to the NASCAR Camping World East and West Series race in 2009, Iowa will host the NASCAR Nationwide Series and NASCAR Camping World Truck Series race later in the season. 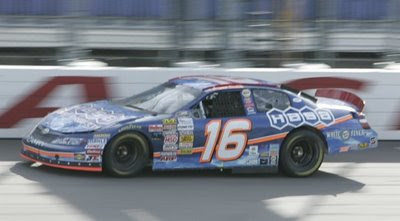 Moses Smith, driver of the #16 Hasa Pool Products Toyota participated in the 2008 West meets East Challenge held on May 18, 2008. While qualifying twenty-fourth, he finished sixth in the West series on the 0.875-Mile Asphalt Oval.